Kalamata passenger and car ferry ticket prices, timetables, ticket reservations and information for ferries sailing from Kalamata to Kythira and Rethimno. Compare all available Kalamata ferry ticket prices in real time and book the cheapest available Kalamata car and passenger ferry tickets sailing to and from Kalamata, Kythira and Rethimno with LANE Sea Lines ferries online with instant confirmation. Book Kalamata Ferry Tickets with LANE Sea Lines for ferries sailing from Kalamata to Kythira and Rethimno online in advance to enjoy the cheapest available ferry ticket price. The price you see is the price you pay. There are no hidden extras or surprises such as added fuel surcharges or booking fees and we do not charge you anything extra for paying with a Visa Electron card. The price we quote you for your selected Kalamata passenger or car ferry ticket, onboard accommodation and vehicle type is all you will pay, and that's a promise. To obtain a Kalamata ferry ticket price and book your ferry ticket securely online please use the real time ferry booking form on the left. You are also able to add a hotel at your destination, or anywhere else, to your ferry ticket when completing your ferry ticket reservation. Kalamata is Messinia’s capital and the second-largest city in the Peloponnese. Compared to its more peaceful surrounds, it is a less inspiring destination for visitors, but museum lovers will be sated. Built on the site of ancient Pharai, the city takes its modern name from a miracle-working icon of the Virgin Mary known as kalo mata (good eye). The city can be reached from other Greek cities by bus and train. Furthermore, the city has an international airport and an important harbour. Ferries are available to places such as the Greek islands of Kythira, and Crete. Kalamata is famous as the town of olive trees, and as the gateway to Mani. As the first town you enter as you leave Mani, Kalamata had the honor of being the town first liberated during the Greek war of independence. After Kalamata was liberated, on March 23rd, a gathering of the liberation forces took place in the centre of Kalamata, at the church of Agioi Apostoloi [Apostles] which Kalamatians hold as a center of the revolution. Eight days after the Maniot declaration, the rest of Greece officially joined the rebellion. Kalamata itself boasts a Frankish Castle, and a railway museum-park, and all the modern conveniences (including five internet cafes). There is also the Benakeion Archaeological Museum, as well as folk art museums, and art exhibitions. The castle of Kalamata is famous in the area, and for over 10's of kilometers in any direction. There is also a Centre for the Intellect, where various cultural events take place throughout the year. To The South: it has the wonders of Mani only a short drive away. The internationally famous caves at Pyrgos Dyros are located south of Areopolis, and attract tourists from all over the world. The beaches at Stoupa and Kardamili are popular with British and European tourists, and well worth seeing. The southernmost point of the European mainland, Cape Tainaron -called by the ancient Greeks as the "Gates of Hades", is about 50km south of Kalamata, and the town of Vathia with its massive stone towers is near there. The region to the south is famous for the stone towered villages that make such striking pictures. To The East: it has the town of Mystras just over the hill, and it is well worth seeing, it is near modern Sparta, which isn't worth seeing). [The "hill" mentioned is Tygetos, the highest mountain in Peloponnesos, with an elevation of 2400m (7500+ feet) and everyone knows it is well worth seeing]. The route between Kalamata and Sparta is some of the most exciting mountain terrain in southern Greece. To The West: Koroni (with its imposing castle) is a local bus ride away. If you go to Koroni from Kalamata, I recommend the Taverna in Ag. Andreus (Called "Petron"? Run by a published Greek Poet!) as a good place to eat as one of the only taverna with someone that speaks English on the route.) The castle of Methoni is well worth seeing also, being one of the most imposing and impressive castles of Peloponnesos, and appears on postcards sold all over Greece. One can easily spend the better part of the day exploring the ruins of the old walled city. (Make sure you take the causeway out to the island at the end of the walled city). Farther west you have Pylos, site of the most famous naval battles of the Greek war of independence and King Nestor's cave from Homer's Iliad. There you will find Nestor's palace, with one of the best preserved royal baths in Greece. [What is known as Nestor's palace is north-east from Pylos, in a place that is called Eglianos, near the village of Chora]. From North to West: a short drive gets you to Olympia, site of the original Olympics. Even closer is the site of Ancient Messini, which has undergone major reconstruction and you can easily get a very good picture of how things were when the place was inhabited. The area also has some of the best remaining narrow-gauge railway lines in the world. For the train enthusiasts, there are truly remarkable examples of stone bridgework out on the lines, as well as the Railway Park, inside Kalamata. Those into Classical Greece will be interested in the fact that many of the nearby towns around Kalamata were specifically listed in Homer's "Iliad", and the area of Messenia was written about by the ancient writers Pausanias and Strabo. Many of the sites they describe are easy to locate and visit today. The area is no less worth writing about today. The town is surrounded by various sites of the Messinian wars with Sparta. The entire Messinian Bay (which Kalamata looks out over) is rich in the stories of Aristomenis battling the Spartans, and stories of many other local heroes. Best Price Guarantee - We always offer you our lowest available LANE Sea Lines passenger and car ferries ticket price to and from Kalamata. There are no hidden extras or surprises such as added fuel surcharges or booking fees and we also we do not charge you anything extra for paying with a Visa Electron card. The price we quote for your selected Kalamata ferry ticket, onboard accommodation and vehicle type is all you will pay, and that's a promise! In the unlikely event you find the same all inclusive Kalamata ferry ticket cheaper in the brochure of any other tour operator we promise that we will do our best to beat that price or offer you the choice of requesting a refund. 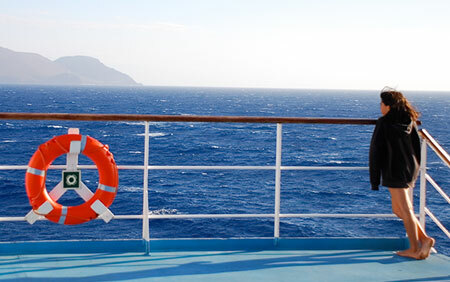 To book Kalamata car and passenger ferry tickets please click here. At ferryto.co.uk you are able to obtain live Kalamata ferry ticket prices, check availability and book car and passenger ferry tickets to and from Kalamata at our lowest available ticket price. Ferryto.co.uk is part of the world's largest online ferry ticket distribution network providing the ability to book over 80 major European ferry operators including to Kalamata and to over 1,200 other ferry routes throughout the UK, France, Spain, Ireland, Holland, Eastern Europe, the Mediterranean, the Baltic and North Africa.